Mark’s brain was not sleeping anymore. He thought he was a state of the art exploration rocket. He was, after all, doing what we have been teaching him to do: be aware, investigate, move. Even with the jib skid slowly evolving into a crooked walk, he “ran” and never stopped, nor did he ever look back. It was as if the previous years of stimulation, patterning, and mental and physical therapies had ignited his jets over night. All I can say looking back, is thank God he was not nuclear. Mark was so little for his age that exploring anything higher than two feet was still not an issue. However, there was one fascinating landscape, which lent itself magically to his attention. His own body. This activity could happen in a split second. No human mother could have prevented it depending her own ingenuity. If I smelled it, it was already too late. Mark was intrigued with his own craps. He must have remembered our voices asking for the one-millionth time about every object that came his way, “ Markie, what is this? What can you do with it?” And the smearing would begin. Imagine turning around to see your child covered in stinking feces. Arms, face, clothes, bedding, walls, toys. I would gasp and then scream in horror. I think it was the first time I had to use the word “NO” to Mark. Of course, I scared him to death with screaming that word in tears. Then he’d start howling back at me and I prayed there would not be any brown stains on his toddler teeth. This read Doom, complete with thick ropes of cobwebs, screeching bats, and flying spears. In fact, Mark’s perfect care provider would have been Indiana Jones. (If I could have used a whip like Indiana, I could have lassoed him from across the room and pulled him to me, instead of running and sliding into him to prevent some disaster. We were signing and using very different vocabulary words now: mad, bad, no, stop, slow down, sorry. With the language comprehension of a two year old, Mark was keeping up with the new lessons the best he could. On the other hand, his lack of comprehension seemed to give him cart blanche to follow his every impulse and cope with the fall out. Just to comprehend that we were angry was a trial for him. Being in trouble was a meaningless concept at best. It must have been the Irish accent of Annie Sullivan’s ghost that made me rent the Miracle Worker again and again, and watch dumbfounded as she taught Helen Keller language, manners, educated her, and “civilized” her. Here then, were the keys to educating Mark. With determination inspired by Scarlet O’Hara and Annie Sullivan to succeed, we continued to let Mark explore, and enjoy the world, but the teaching was intensified, and expectations kept high. Cause/effect patterns were our main teaching focus. We too, did the best we could to keep after our latent toddler, but his poop smearing had to stop. Mark awoke at five A.M. (he must have been part rooster too.) He was up intermittently during the night exploring and playing all over the house as well. We were all exhausted and sleep deprived. With his new doo doo fascination we had to “man” him every minute or face the consequences. What would we do if Mark never stopped doing this? We felt martyrdom looming, but without the saintly acceptance that his habit was sent to us from God as a test. No, we had already rejected the idea that Mark was sent as a heavenly test from God. People cooed over us all the time, saying,” God sent Mark to you because he knew you were special, and you are the right parents for him.” We hated to hear this. If we were such great folks, why didn’t we get a child prodigy who finger-painted in colorful oils, on canvas? Mark’s poop art was at least hidden from the general public for while. Our family’s dirty little secret was let out of the bag though when Mark gave my favorite chair a makeover from blue chintz covered in wildflowers to crusty brown all over. We were minutes away from going on vacation; Mark got lost in the shuffle, but had found something to keep himself busy. In tears, I called a few upholstery cleaners. Only one would tackle the job. I had to leave the chair in our backyard and the man would clean it out there. He promised us it would be like new when we got back, and it was. He promised he would not tell any one else, and I will never know if he did or didn’t. The most traumatic of these times was an afternoon I promised Ryan, who was six, we would work on a school project together. However, Mark was having nothing to do with nap time. Ryan and I were already worn out from chasing and monitoring Mark all day, and we were in desperate need of some respite. One of the most delicate operations of being parents of a special needs child is balancing time and attention with the other siblings. I believe this is a losing battle, but if Scarlet O’Hara refused to quit, why should we? I shook my fist in my living room and swore, “ As God is my witness, I’ll never go hungry again!” What I meant was, I had two sons, and one would not steal all of my time from the other. I let each word slip from my mouth with all of Scarlet’s passionate sincerity. So, Ryan and I kept putting Mark in his bed and shutting the door, and Mark would keep getting out of his room, running down the hall and distract us. After fifteen minutes, we were crying with weariness and grief. I desperately wanted to focus on Ryan, and he was desperate for my attention. Suddenly, we were having a war with a three year old and Ryan and I would not give up the fort easily. Can’t remember whose idea this was, but with tears streaming down our faces, we popped Mark into his bed, ran out of the room, and tied a rope from his doorknob a door on the opposite side of he hallway. NO matter how clever a boy he had was, he could not get out. Sinking this low was cause enough for more guilty tears. However, if Mark wanted a war, we were bigger and smarter than he was. No two people ever felt so smug as we did that afternoon. We finished the project and had time to cuddle on the couch to watch an entire movie all by ourselves. All guilt aside, it was one of the best and worst afternoons of my entire life. He was covered in crap. His entire room had been finger-painted a stinky earthy brown. My first instinct was to protect Ryan from such a sight and quickly closed the door. We went to his room and commiserated for quite awhile. I didn’t defend Mark much. I finally left Ryan to recover, and got back into Mark’s room with a bucket of disinfectant -before he could find us. Needless to say, developmentally delayed or not, he had exacted a fitting revenge. And the war? We conceded momentarily. A few weeks later, I found the courage to admit to Mike Mann at Alta California Regional that Mark had become relentless in his doo doo hobby. Of all the challenges we knew we could live with , we could not live with that. He referred us to a behaviorist agency who sent out a nice Sister of the Oath. Mark had coincidentally done a finger painting session minutes before she arrived so I wrapped him in an old plastic tablecloth of huge purple flowers, and left him sitting confirmed in his high chair so she could see the problem. Sighing, she said she’d seen it before; this was her specialty. SPECIALTY? This was a Real Sister here! OKAY, she signed again, Mark can be taught not to do this with an appropriate reaction from you. From me? Hellllohhh! Appropriate reaction? Didn’t most people draw back in horror and scream at seeing another human covered in his own feces? It made sense to give him this message during the day, but hold his hands up in the air? I looked at Mark, trapped in the high chair. You want me to grab his poopy arms and hold them in the air? Can you show me what you mean? “No,” she replied with alarm. I can’t because my job protections prohibit that- so many germs, you know? I thought about the acres of feces covered items I had cleaned without gloves in the last few months. I was lucky not to be in the hospital! “Oh” she cried out, I almost forgot!” And she pulled out a box of latex gloves for me to use. Yes, of course, while my crusty brown child is wandering through our home looking for something else to poop paint, I will remember to carefully put on my protective rubber gloves! We got complaints all right. Mark sounded off like a siren, doing a brownie jig at the same time trying to get his arms back to himself. The neighbors could hear it. They’d call! Everything all right over there? What? Did they think we were abusing Mark? “Sure” I’d say. We are just a happy NORMAL family over here, nothing to worry about. Let’s not forget whom we were dealing with. This was Markie Sparkie of the Divine Raisin Test. We gave him time. We stuck to our end of the strategy. We expected him to learn, and he did. It took months, and for about a month we were a happy, normal family again. 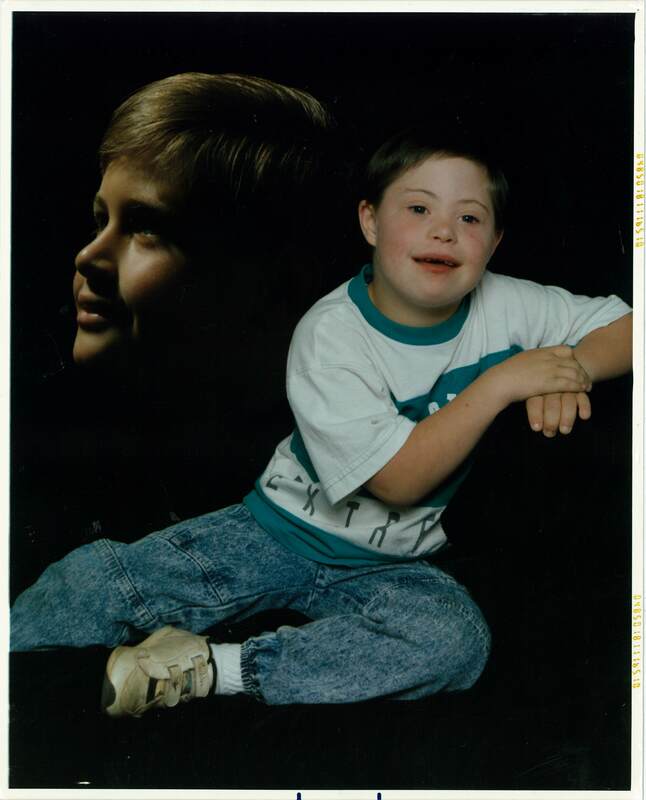 This entry was posted in A Mother's Diary, Down Syndrome Help, Education, Raising Down syndrome Boy, The Early Days, The Markie Stories and tagged Carmella Miller, Carmella's Corner, Down Syndrome Help, Down Syndrome in Public, Down Syndrome Nevada City, Down Syndrome Sibling, Down syndrome stories, Infant Stimulation, Toddler Movement. Bookmark the permalink.